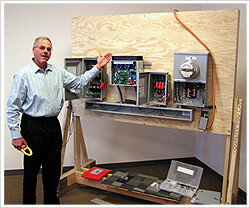 Solar Mike is an experienced solar trainer and educator. He has helped prepare more than a thousand contractors and businesspeople in solar design, engineering, installation and business development. He can provide staff and team training in all aspects of solar energy. Solar Mike will be teaching "Solar Sales and Design Training" from Aug. 14 through Sept. 20, 2012 at the Newark, CA campus of Ohlone College. The six-week class meets twice a week, and will help prepare qualified participants for sales careers in the PV industry. More information is available. This free course provides an introduction to the design and sale of solar electric systems (PV systems). It covers general design, PV and electrical equipment and installation, site feasibility and shading analysis, financial incentives and analysis, the sales process and sales proposal, and safety. The class is offered as part of the Home Energy Retrofit Occupations (HERO) Program, which is funded by a $2.5 million Community Based Job Training Grant, as implemented by the U.S. Department of Labor's Employment and Training Administration and hosted by San Mateo County Human Services Agency.